Press Release (ePRNews.com) - BOCA RATON, Fla. - Jun 25, 2018 - The fourth annual Boca Raton Mayors Ball presented by Rotary Club Downtown Boca Raton is set for Saturday, November 17 at the Royal Palm Yacht Club. Celebrating the City of Boca Raton’s visionaries past and present who have elevated the community and elected officials who exemplify Rotary International’s motto, “Service Above Self”, the black-tie dinner/dance gala event will raise funds to support health and wellness needs of Boca Raton nonprofits. The evening will feature a red carpet arrival and cocktail reception followed by a grand epicurean experience created by Royal Palm Yacht Club Executive Chef Joseph DiPrima, the live music of the Steve Chase Band and the presentation of the George Long Awards – named for the City’s first appointed mayor in 1924. Jerry Fedele (Individual) –When Fedele joined the 400-bed Boca Raton Community Hospital as CEO in 2008, the nonprofit community hospital was losing money and laying off employees. Now, through his decade of leadership, the beloved community hospital is profitable and growing, renamed Boca Raton Regional Hospital (BRRH) in 2012 to reflect its vision. Under his management, BRRH built the Marcus Neuroscience Institute, the Christine E. Lynn Women’s Health and Wellness Institute, the Lynn Cancer Institute, and the Gloria Drummond Physical Rehabilitation Institute. He also led the hospital to establish the BocaCare Network of physicians, a group of urgent care centers and an academic partnership with the Florida Atlantic University Charles E. Schmidt College of Medicine that includes graduate medical education and medical residencies. With Fedele at the helm, Boca Raton Regional Hospital is a thriving community asset contributing to making Boca Raton a great place to live, work, play, educate “and heal”. · Modernizing Medicine –Developed by successful serial entrepreneur Daniel Cane and Dr. Michael Sherling, the company’s mission to “modernize medicine” helps physicians increase efficiencies in their medical practices while improving both treatment and business outcomes. The company’s cloud-based Electronic Medical Assistant®) (EMA™) electronic health records (EHR) system developed by physicians features dramatically different technology—specialty-specific EHR technology that thinks like a physician. Modernizing Medicine’s revolutionary EMA system, intuitively adapts to each individual doctor’s unique style of practice and remembers preferences providing health care professionals with easy access to patient’s notes, billing information and treatment outcomes for millions of other patients. The company fosters corporate social responsibility, from the executive team to each employee who is encouraged to give back to the community in their own personal way by using their annual “paid day off benefit” to donate their time and talents to the charity of their choice. Individuals are encouraged to become involved members of the community by joining local organizations to encourage development both professionally and personally that extends outside of their day-to-day responsibilities. “With the exceptional caliber of our 2018 George Long Award recipients and the community excitement that drives this annual iconic evening, we anticipate another early sellout and thus encourage sponsors and event goers to reserve their seats as soon as possible,” shares Mayors Ball Co-chair Rick Howard. Co-chair Arlene Herson, who has served as Red Carpet Mistress of Ceremony each year since event inception, reports that funds raised each year through the annual Boca Raton Mayors Ball fulfill grant requests approved through the Rotary Club Downtown Boca Raton’s “Service Above Self” grant program. Launching each January, the grant program is open to all Boca Raton-based nonprofits with needs for health and wellness services and programming. Proceeds from the 2017 Mayors Ball benefited 24 Boca Raton-based nonprofits and Rotary International’s Polio Plus Program that helps globally to eradicate polio and other diseases. 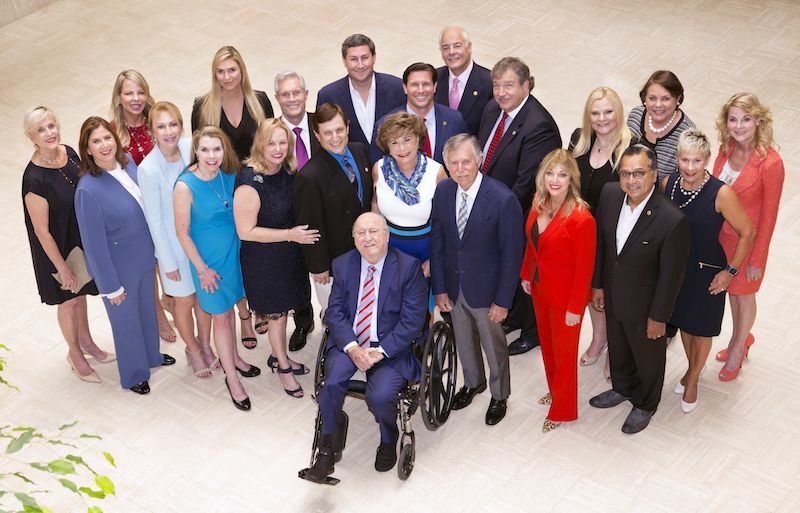 With Bobby Campbell serving as the 2018 honorary chair, the Event Host committee includes Mayor Scott Singer, former Mayors Susan Whelchel, Bill T. Smith and Steven Abrams, who currently serves as a Palm Beach County Commissioner; Boca Raton Deputy Mayor Jeremy Rodgers; Council Members Monica Mayotte and Andrea Levine O’Rourke, Patricia Carpenter, Mary Csar, Terry Fedele, Gloria Hosh, Michael Kaufman, Bonnie S. Kaye, John Kelly, Debbie Leising, Christine E. Lynn, Doug Mosley, Barb Schmidt, Pat Thomas, John Tolbert and Connie Siskowski. Celebrating “Boca at its best” the Boca Raton Mayors Ball “Service Above Self” Fundraiser is an opportunity to recognize individuals and organizations that through their daily community involvement and business practices promote the city of Boca Raton in a positive way and showcase Boca Raton as a great place to live, work, play and educate. For sponsorship/underwriting opportunities and ticket reservations, visit www.rotarydowntownbocaraton.org or contact Deborah Freudenberg at 561-299-1429, email mayorsball@rotarydowntownbocaraton.org.